Each specialist has their own professional perspective. Guidelines and protocols aren’t very flexible. Algorithms adapt to meet the patient’s needs. It hurts to send a patient home underserved. Do you wish that you could improve the lives of one more person and their family each day? Silicon Valley thinking for cars is all about real-time observations and feedback for control. The SV quest to maintain Moore’s Law brings you ever faster, cheaper computers. You may know about IBM’s quantum computing that will someday take AI for medicine mainstream. Can your patients wait that long? 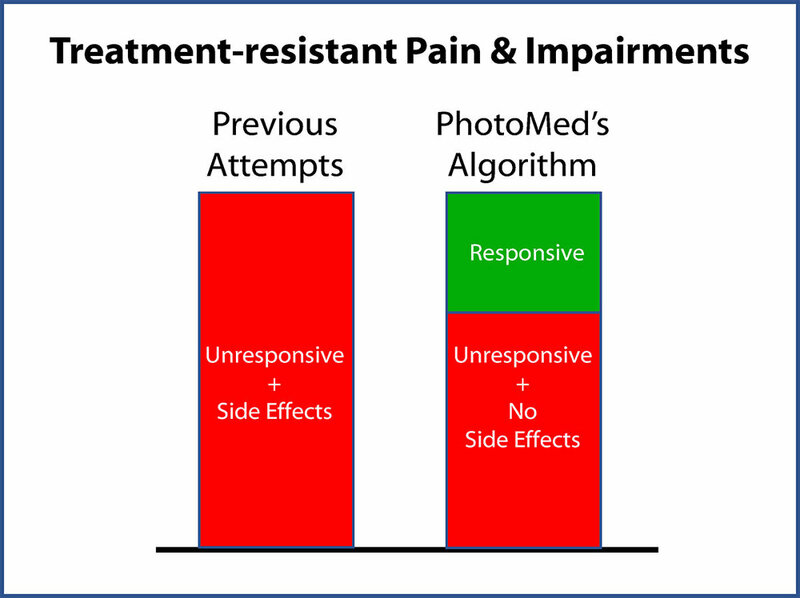 PhotoMed’s team thought, why not apply the same methods to solve chronic pain? PhotoMed’s team of nerdy engineers developed the algorithm for pain specialists. To name a few; anesthesiologists, physiatrists, neurologists, and neuroscientists. Today, it’s their operators who apply the algorithm using the Vari-Chrome® Pro. Can electronic sensors help solve intractable medical problems? Thermal imaging shows the temperature of skin. Cold limbs form symptoms of many dreaded disorders. The imaging provides feedback to the algorithm’s operator. Watch what the operator sees. Time is compressed: 15 minutes = 11 seconds. 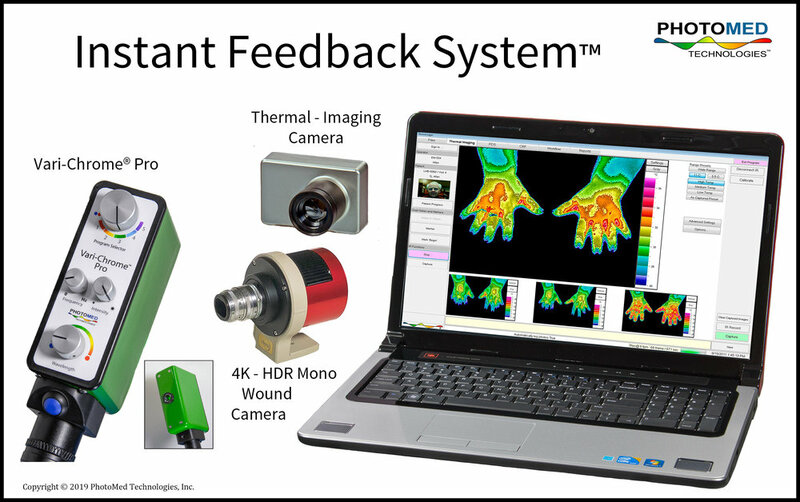 Thermal imaging shows a man's hands warming in response to an application of therapy according to PhotoMed's algorithm. The operator observed warming and did not need to apply therapy a second time. For 150 years, practitioners used visible light to benefit their patients. Today, red and IR dominate.